Since October 1892, countless schoolchildren across the nation have begun their school day by reciting the Pledge of Allegiance as a daily patriotic ritual. Few students, however, could tell you when the tradition began, or even who wrote the words that so many of them have memorized. Today’s Pledge of Allegiance is a legacy of the push for "Americanization” that defined the social studies curriculum of the nation’s schools from the late 1880s through World War I and shaped the visual culture of classrooms throughout much of the 20th century. In the late 1800s, the steady rise of the nation’s immigrant population created anxiety among many native-born Americans who feared that newcomers were not adapting to their new homeland quickly enough. During that period, numerous veterans’ groups, patriotic societies, and community groups—including the Patriotic League and the Grand Army of the Republic—led grassroots campaigns to promote patriotism and American values within the nation’s schools. Patriotic imagery proliferated in school supplies, with items depicting American flags, eagles, and images of Liberty—symbols that non-English-speaking students could easily recognize. 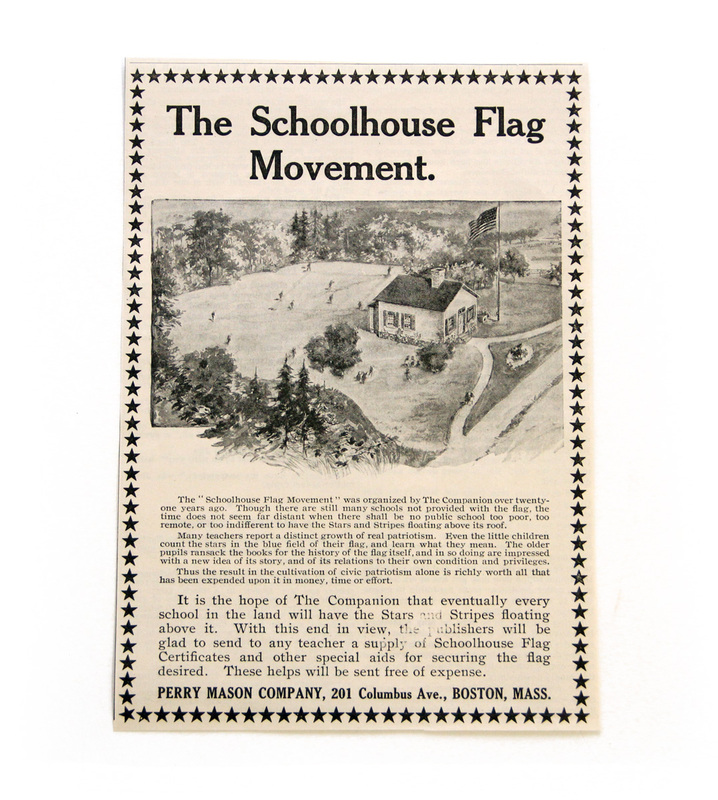 For companies that manufactured and advertised school supplies, this patriotic fervor was a new and often lucrative business opportunity. 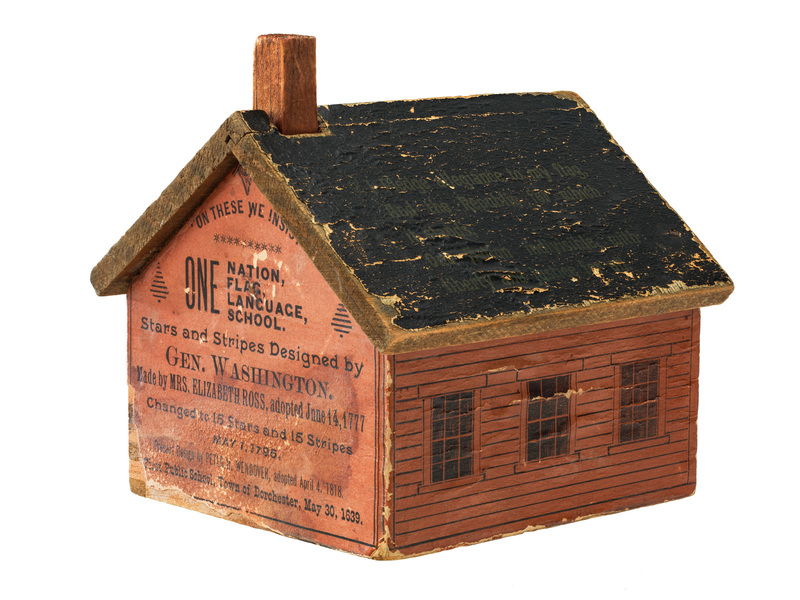 The end of the 1800s was a time of rapid growth for the nation's public school system, and as the museum’s collection of educational materials shows, citizens who supported new schools showed a preference for patriotic furnishings—especially if they were economical. Together, these forces helped produce the pledge that is now known as the Pledge of Allegiance. A version of the Pledge of Allegiance was first published in The Youth’s Companion, a popular family magazine, on September 8, 1892. Also known as The Companion—For All The Family, the popular family magazine was published from 1827 to 1929, when it merged with The American Boy. The magazine became involved with Americanization efforts in part because of the personal interest of the magazine’s leadership, but also because of the publisher’s desire to boost subscription sales through gimmicks and giveaways that appealed to the patriotic fervor of the times. These gimmicks included campaigns to distribute American flags to every school and the promotion of inexpensive images of George Washington to supplement other portraits gracing classroom walls. Both of the magazines’ efforts were successful in boosting magazine sales and, in the process, fostering a tradition of patriotic material culture in American classrooms. When Youth’s Companion editor Daniel Sharp Ford was asked to spearhead the promotion of the National Public School Celebration by the American Youth Association, Ford asked his nephew James Upton, the head of the magazine’s premium department, to come up with a plan that would also benefit the magazine. Upton enlisted the aid of writer and ex-minister Francis Bellamy. Together they came up with a plan that included a new pledge to the flag. While other salutes to the U.S. flag were performed throughout the late 19th and early 20th century, their pledge was to be designed for children, and it was to be ceremoniously recited across the nation as part of the National Public School Celebration. With the plan in place, Bellamy successfully lobbied Congress for support. He also received the blessing of President Benjamin Harrison. In anticipation of the National Public School Celebration, The Youth’s Companion published the new pledge in its September 8 issue. Originally, the celebration was scheduled to occur on October 12, 1892, in order to coincide with the 400th anniversary of Columbus’s birth, Columbus Day, and the groundbreaking celebration of the Columbian Exposition in Chicago. However, due to construction delays and other last-minute changes, the celebration was postponed until later in the month. (Interestingly, New York City students went ahead with the planned celebration on the original date, making them the first large group of students to recite the Pledge of Allegiance.) On October 21, 1892, tens of thousands of children across the country recited the pledge as part of the National Public School Celebration. Much has been written regarding who actually came up with the words for the Pledge of Allegiance, since both Upton and Bellamy worked on the campaign, but in 1957 the Library of Congress officially affirmed Francis Bellamy as the author. (The concept of a new pledge, however, appears to have been Upton’s). Over the past 125 years, the Pledge of Allegiance has changed in many ways, but it has remained a fixture in the nation's classrooms. Although the museum has an excellent collection of artifacts depicting Americanization efforts in the schools from 1880 to 1920, we are still very interested in acquiring a September 8, 1892, issue of The Youth’s Companion and a copy of the original program from the National Public School Celebration. If you would like to donate a copy of either of these to the national collections, please consider sending us a message using this contact form. Debbie Schaefer-Jacobs is curator of the History of Education Collection and the Harry T. Peters America on Stone Collection in the Division of Home and Community Life. She is interested in all manner of American classroom artifacts and visual culture of the classroom.